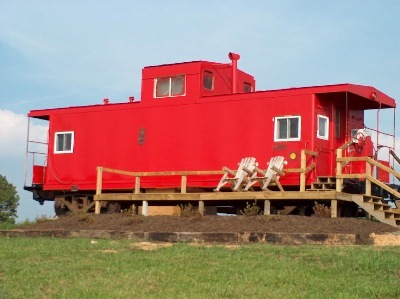 Where you can sleep in a real caboose. Come spend some time in a real, completely refurbished railroad caboose (with all the modern amenities) just off the Blue Ridge Parkway at Orchard Gap, approximate mile 193.5. Probably the most unique lodging along the Blue Ridge Parkway. Grassy Creek Cabooses are cabooses renovated into cabins for lodging/rental in the Blue Ridge mountains near Fancy Gap Virginia with private bath, kitchenette, 2 person Jacuzzi's, satellite TV, heat and air in each unit. We are convenient to I-77 near the NC/VA state line or highways 52 & 58. 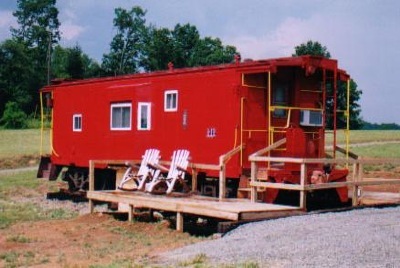 Grassy Creek Cabooses were built in the great old USA, we're family owned and operated (on site). Please tell your friends, family and coworkers about us. Perhaps you'd prefer to stretch out in our large mountain cabin, we call it the Depot. It's similar in appearance to some of the old depots that once dotted the landscape at small railroad stops across the country.The 2 person jacuzzi is in the bedroom with a queen size bed and an additional queen size sleeper sofa is in the living area. The depot is very spacious with over 500 sq/ft (16'x32') and features 3 decks 2 of them covered as well as all the other amenities of the cabooses. There is also a 34" flat screen TV in the living area. You will not find a cabin this size with all the extras we provide for less. Pictured are a few of the remaining mining cars from the old Austinville lead mines. There is only limestone left now but the mines used to produce the lead for musket balls, cannon balls and other things during the Revolutionary War and the Civil War. The lead was taken to the Shot Tower on the New River & molten lead was dropped down the tower into the river where it immediately cooled to form a round ball. The mines were opened in 1756 and were discovered by Colonel John Chiswell. The center car was an actual dynamite car but I had to rebuild it after it was out in the weather for around half a century. Our rates (see below) are comparable or lower than anyone else that offers any where near as much as we do. We have a more relaxed, private setting. Our views are more awesome especially the sunsets. Plus we offer the most unique accommodations around. As mentioned we have Jacuzzi's and Extended Hi Def satellite TV (on the 32" or 34" 1080p flat screens) with over 145 channels including the ESPN's, Fox, NBC & CBS sports channels in everything. Some others offer no TV, local channels only or basic satellite. Unlike others we do not raise our rates during high volume weekends like the Labor Day flea market. Being located just off the Blue Ridge Parkway there is virtually none of the traffic or traffic noise sometimes associated with the parkway. We are members of Virginia Green. They promote recycling, conservation, energy efficiency and other environmentally friendly projects. There are bins on the decks for recycling. We do conserve electricity so we need advance notification to make sure everything is turned on for your stay. Reservations are suggested but drop ins are also welcome, just have to cut things on. It requires more work but we believe it is a good cause to recycle. We are convenient (within 1.5 to 2 hours) to several NASCAR tracks if you are traveling for a race. Those tracks are: Bristol Motor Speedway, Lowe's Motor Speedway, and Martinsville Speedway. Whether you're just stopping over while traveling the Blue Ridge Parkway or as a home base for the many local activities you will find Grassy Creek Cabooses to be a most enjoyable and memorable place to spend some time. Mabry Mill the most photographed spot on the parkway is north about 18 miles. We are a convenient stopping point here in Fancy Gap for folks traveling from the Indiana/Ohio region down to Myrtle Beach via the I-77 corridor. scene, we are near Floydfest, Blue Ridge Music Center and the Galax Fiddlers convention. We're on top of the mountain above Mount Airy which hosts Mayberry Days and Autumn Leaves. 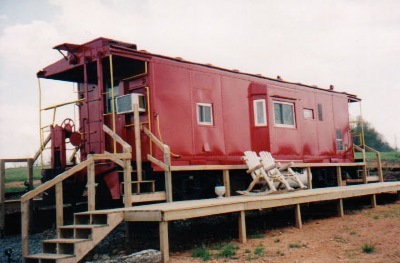 All of the cabooses and Depot are furnished with the following: 2 person Jacuzzi, Satellite TV, queen size bed, refrigerator, microwave, toaster oven, coffeemaker. We have furnished them with plates & utensils for grilling out on the charcoal grill at each caboose. They have a private bath, queen size bed and hair dryer. There are decks with large rockers and a table in between to rest your beverage of choice. Caboose 494 has a full service kitchen with an oven/cooktop & all utensils including pots & pans. The cabin (depot) has a kitchenette with a 2 burner hotplate, 042 & 407 have kitchenettes. Linens are furnished with each caboose. We can be emailed at thecabooseman@yahoo.com or phone us at 276-398-1100. 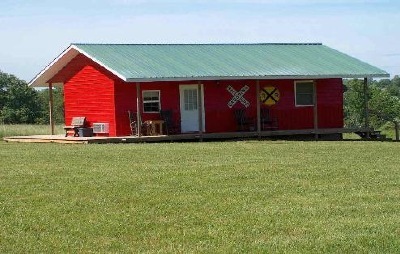 Rates are $99+ tax per night for the cabooses and $109+ tax per night for the depot. We have a special when calling us directly, you can stay 5 consecutive nights and get the 6th night free. Not applicable if reservations are made elsewhere on other sites. Rates are based on up to 2 person occupancy. Additional fees may be involved for additional people. Check in time is 2 pm or after and checkout is by 11 am. We offer the best value around with our prices, amenities, views and accommodations. Smoking restricted to outside. There is a 7 day cancellation policy. Some weekends, holidays or special events will have a 2 day minimum or more. No Shows will be charged. Our replica of a water tower that was used to resupply the steam engine water tanks. Where are the girls from Petticoat Junction?